One in five adults has at least mild sleep apnea, and it also affects 1% to 3% of children. Yet people who have obstructive sleep apnea (OSA) – a more serious health condition – may not even be aware they have a problem. If someone close to you has spoken of your loud snoring and has noticed that you often wake up abruptly gasping for air, you should consult your oral and maxillofacial surgeon. 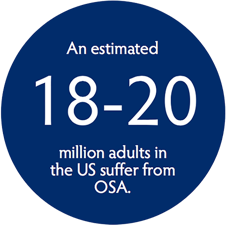 In addition, OSA causes daytime drowsiness that can result in accidents, lost productivity and relationship problems. Excess tissue, large tonsils, a large tongue, blocked nasal passages, the position of the jaw, and airway muscles that relax and collapse during sleep may restrict the upper airway of OSA patients when they sleep. This airway reduction may increase the likelihood of a temporary pause in breathing known as "apnea." Depending on whether your OSA is mild, moderate or severe, treatments can range from behavior modification to oral appliances to a C-PAP device. Surgery may be a good alternative for some patients, but it's important to keep in mind that no surgical procedure is universally successful. If surgery is appropriate, your oral and maxillofacial surgeon will discuss several procedures that may be right for you. The hyoid bone is located above the level of the thyroid cartilage (Adam's apple). The procedure secures the hyoid bone to the thyroid cartilage to help stabilize this region of the airway. 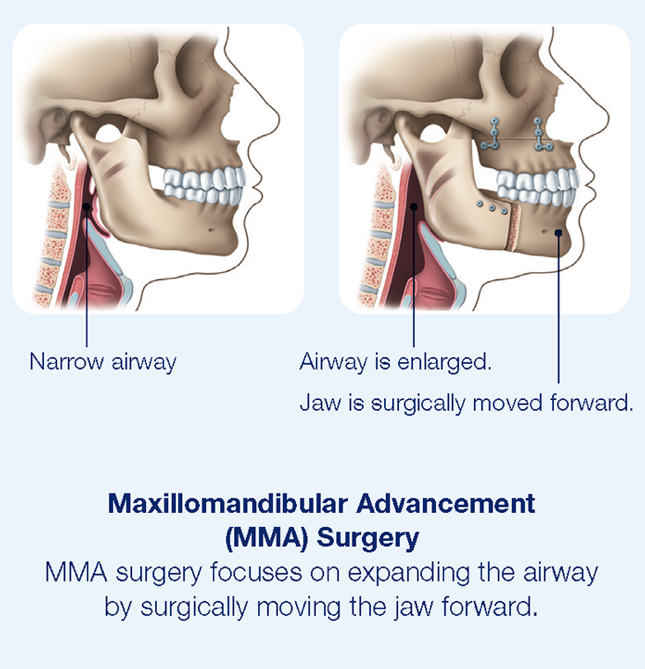 This procedure surgically moves the upper and lower jaws forward along with the soft tissues of the tongue and palate, opening the upper airway. For some patients, MMA is the only technique that can create the necessary air passageway.